Are you wondering how to use Twitter to increase traffic to your blog? To learn how to use Twitter to grow your business, I interview Kim Garst for this episode of the Social Media Marketing podcast. In this episode, I interview Kim Garst, CEO of Boom Social, a company and blog that specializes in social media marketing. One of Kim’s areas of topical expertise is Twitter marketing. Kim shares how she uses Twitter to promote her content and offers. You’ll learn about what type of content works best and how frequently you should share it. How do you use Twitter to help your business? A lot of people don’t use Twitter search in the same context as they would with Google. In many cases, the news hits Twitter before it hits the major news channels. There are real people out there who share real information in real time. With Twitter, you can leverage the search function as a way to keep track of your competition. You can search for keywords and find conversations in real time. It’s a great way to pay attention to trending topics. You’ll hear an example of a news story where 85% of the people polled said they found out about an incident on Twitter before the traditional news got the information. One of the biggest values that Kim has found for Twitter is to drive traffic. It’s the most responsive targeted traffic source that you can have at your fingertips. 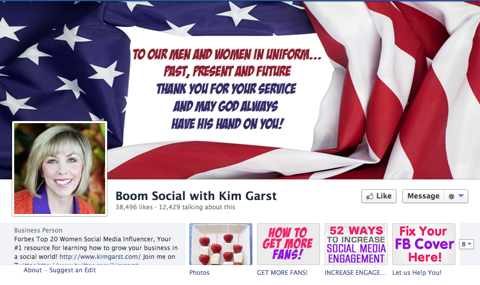 Listen to the show to find out how Kim uses Twitter to drive traffic to her Facebook Page. Kim describes the free offers on built-in tabs on her Facebook Page and why she tests them first on Facebook. Kim uses built-in tabs on her Facebook Page for free offers. Twitter is unique in that you can share your free offer 2-3 times a day; whereas on your Facebook Page it would be considered overkill. A tweet has a lifespan of about 30 seconds, so you can share your free offers multiple times a day and it’s seen as acceptable. Different viewers see them as they come through their news feeds. Kim explains the strategy behind sharing the same link multiple times a day and why you shouldn’t use the same tweet throughout the day. You’ll want to switch them up and test different wording to see what people respond to the most. 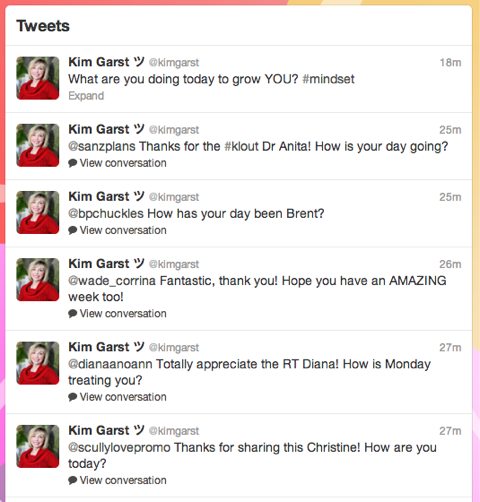 Kim uses HootSuite to schedule her tweets. 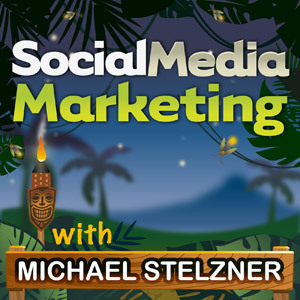 You’ll find out why it’s the number-one opt-in source for leveraging her Twitter traffic to her Facebook Page. Kim shares how she monitors and keeps track of each tweet’s performance and why you should only run 2 or 3 at a time, otherwise it’s overwhelming. You’ll hear what type of content Kim shares from her own articles and how frequently she schedules them. Kim shares her blog content on Twitter. Twitter is Kim’s number-one traffic source. 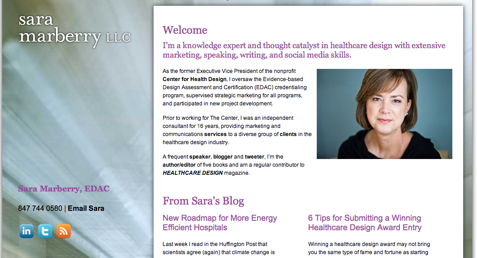 She has leveraged the same concept for her clients and increased their traffic by 100-400%. Kim highly recommends that you share content that is still relevant and holds value. You’ll hear an example of how to use a hashtag when promoting a blog article and why hashtag content has more relevance. Listen to the show to find out what is one of Kim’s top converters. Kim says the mistake people make with their Twitter account is to remain inactive. You need to be consistent regardless of which platform you use, otherwise people will find someone else who is. You have to be active. You need to engage with your followers. Kim talks about people whom she calls “broadcasters.” They don’t engage with people. When people engage with Kim on Twitter, they’re stunned when she responds. If you’re on Twitter and you want people to consume your content, then you need to engage. When Kim first started out, it was easier to engage with people. She now has almost 150,000 Twitter followers and had to come up with a system. As you grow, so do the time demands. The strategy will change as you grow your following. You’ll hear about two brands that pay attention and talk to their audiences. Listen to the show to learn what the differentiator is between companies. Kim believes that social is moving to a more visual context and we can see it across the board. Facebook and Pinterest have enlarged their photos. Even the Mashable format is much more visual. Websites are more visual in the way they display their content. With Twitter only having 140 characters of text, they have had to incorporate some visuals. It was critical that they did this. You can now include videos and they’ve enlarged the photo size. Kim thinks it’s important to be visual, as it’s a great way to show the visual aspects of your business, whether for product demos, a contest or to showcase your brand. A lot of people consume information in a visual way. You’ll hear why it’s important to have a great profile photo on Twitter. Listen to the show to hear what Kim thinks about Vine and why she feels most people aren’t embracing it like she hoped they would. About a year and a half ago, there were a lot of apps that served the Twitter market, but then when Twitter reined in their APIs, many businesses that had built out around serving the Twitter market went out of business. There are still a lot of businesses struggling with the changes that Twitter is making. 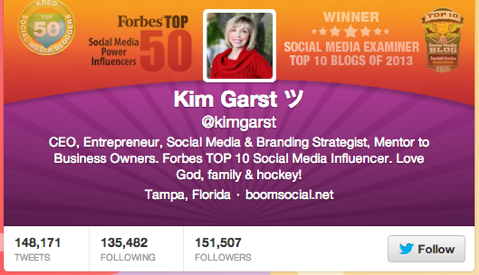 You’ll hear why Kim loves HootSuite and how it’s one of the only management platforms out there that includes Google+. HootSuite is great for managing Twitter. Listen to the show to find out about another tool that Kim uses called ManageFlitter. This is a wonderful question. There are four main reasons why they may not be subscribing to your blog. They don’t realize they can. You’re not asking them to. They’ve been programmed to receive an email from you. They don’t like the content you produce. For the next email to your industry insiders, send it specifically from your personal account. Tell them that this is the last email you’re going to send them and if they don’t want to miss your blog articles, they can sign up for your automated email newsletter service. You’ll discover what you need to do to help evangelize your blog and why you should consider an automated email broadcast service, such as FeedBlitz or AWeber. Back in Episode 37, I introduced you to a special project called My Kids’ Adventures. I want to let you know that I’m going to share a little bit each week about this project. My Kids’ Adventures is a brand-new blog that we’re starting at Social Media Examiner. It’s targeted to parents, especially those who have preteen kids. It’s for busy parents who don’t have enough time to get creative, yet want to have fun adventures with their kids. The first lesson I want to share with you is that whenever you’re about to start something that’s radically different or new, it’s wise to come up with a vision statement. A vision statement is something that you and/or the people on your team can rally around. Even if you’re just a one-person operation, it’s important to do this because it’s very easy to get off track when you begin a new project. You want to come up with a very simple statement that explains what the entire thing is all about. You’ll hear about the vision I had for My Kids’ Adventures and how I came up with the vision statement. You’ll also discover why the first sentence is critical in a vision statement and what you need to consider when writing it. I hope that you’ll be inspired this summer to think about the launch of something new and by joining me on this journey, you’ll pick up some little lessons along the way. If you’re interested in learning more about My Kids’ Adventures, you can do so by visiting here. Connect with Kim Garst on her website. 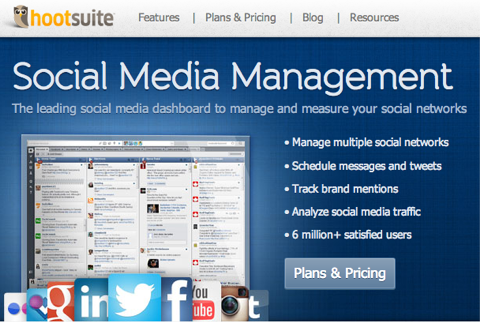 Check out SocialOomph and HootSuite to help with your social media productivity. Use TweetDeck as a Twitter management tool. Head over to Zappos and JetBlue to see how they engage with their audience on Twitter. Learn how to edit your profile photo on Twitter. Take a look at the Vine app. Head over to Sara Marberry. Check out FeedBlitz and AWeber‘s automated email broadcast services. Learn more about My Kids’ Adventures. What do you think? What are your thoughts on using Twitter to increase traffic to your content? Please leave your comments below.